This entry was posted in Uncategorized and tagged Aaron Siskind, affirmation, art, constantly creative, creativity, drawing, exhibition, Jane Dashfield, Jane Reed Wilson, Philadelphia Sketch Club, photo exhibition, photography. Bookmark the permalink. Surely, craving affirmation is an honorable need, & richly deserved for the Constantly Creative Jane. Your many inventive images have enriched & delighted me since we first met: photos, paintings, drawings, graphic design, words (both written and spoken), music – well, you get the idea. 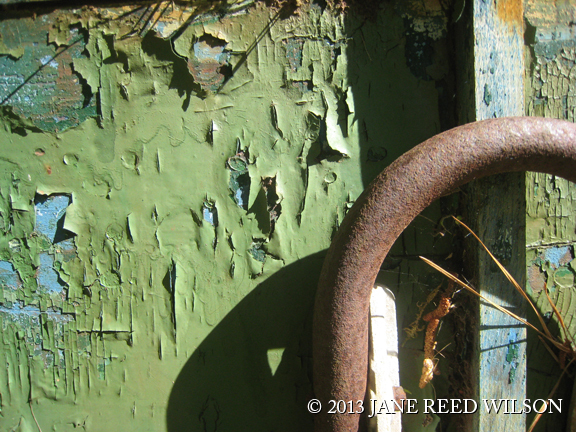 Congrats on admittance to the juried show with that evocative photograph. Always a pleasure learning what your curiosity and imagination will lead forward to next. Thank you so much, for your always affirmative words over the years. One wants an appreciative audience and that you have been. You surely are no creative slouch yourself, and thusly I give you a blue ribbon for all the creative ways you look at things, and all the cleverness and thoughtfulness in you. Lovely to see that image here, and to read your thoughtful words. (I don’t divulge…!) Good luck to the winners! Thanks, Helen! I’m sure it is interesting to see a new take on something you know well. The winners were quite amazing–some looked like drawings or paintings rather than photos. Amazing what you can do with a camera and a little Photoshop..
I’m a bit late here, but I love this post. You bring up some really interesting points … I agree that there’s no true “yes” or “no” to whether we need affirmation and what kind we need — but it does feel great sometimes! And then, as you said, some of my favorite things I’ve created have been rejected many times. And I love them! And, I’m glad I put them out there. Congrats on your wonderful photograph! Thank you, Jill, for your thoughts and good wishes! My walls are going to start getting pretty full if I keep entering exhibits (and maybe that’s a good thing).